Award-winning 1884 Bridgeford House was inducted into the National Register of Historic Places(NRHP), written up in Architectural Digest Magazine for its original architecture and won awards from the Eureka Springs Garden Society for its “secret” garden. Experience the Victorian delight this luxury inn combines with southern hospitality and Victorian charm. We offer Queen and King-size beds, some suites offer gas fireplaces, jacuzzi tubs, private decks and private entrances. Enjoy Self-serve Continental Breakfast, 24-hour Coffee, Tea Bar and Off-street parking. The 1884 Bridgeford House is a Queen Anne/Eastlake home in the heart of the City of Eureka Springs, Arkansas. The 1884 Bridgeford House was built after the American Civil War by Captain John Bridgeford and his wife Mary Bridgeford, both prominent members of the community. They had previously managed the Pence Hotel of Eureka Springs which later burned down. The Historic Bridgeford House is located on Spring Street in one of the largest Historic Districts in the United States. Eureka Springs was inducted into the National Register of Historic Places (NRHP) in 1970 and then the house itself is also listed on the registry. 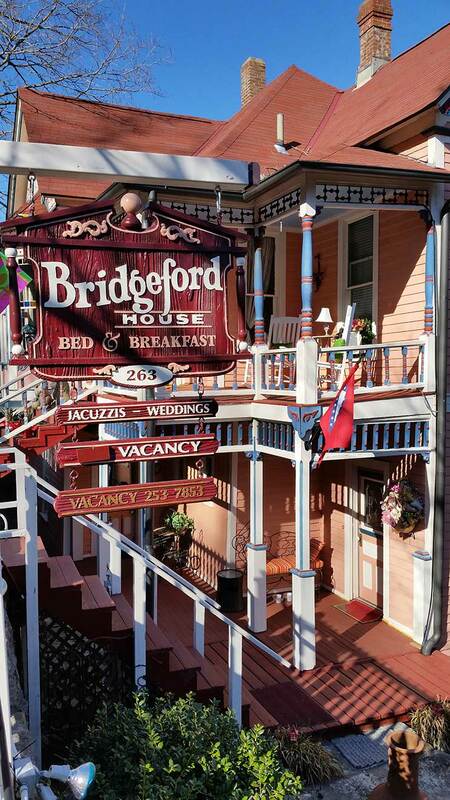 The 1884 Bridgeford House has been operating as one of the most popular inns in Eureka Springs since 1980. You will experience the difference between a traditional hotel and the unique, luxurious experience with a home-style atmosphere for those that prefer the cozier, personal and casual lodging experience. Historic Bridgeford House gift certificates are available for any occasion by contacting us directly at 479-253-7853 to discuss amount and wording. We recommend a certificate for a flat amount to be used towards a stay rather than a particular room since the room may not be available for the dates the recipient wants. Recipients can upgrade the certificate and pay the difference. For example; add a night, add a package or upgrade to optional gourmet breakfast prepared and served to guest room. The historic 1884 Bridgeford House is on the historical register and is frequently toured by historic home enthusiast. And includes functions and fundraisers for the preservation society. As well as paranormal enthusiast it is one of the exclusive property's that is toured by eureka springs unique walking/van ghost tour and featured in books one for example, "where ghost dwell" and Americas haunted inns.